This is the story of the boom gate that once protected the Furlong Road level crossing on the Sunbury line, and the adventures it has had since it was made redundant by grade separation. The boom gate was there to prevent motorists from driving into the level crossing – but motorists still ended up on the tracks, with fatal consequences. In April 2014 funding was approved to remove the nearby Main Road crossing in St Albans, with Furlong Road being added to the project in June 2015. By 2016 work was well underway at Furlong Road, with a deep trench being dug to carry trains railway beneath the road. Trains on the Sunbury line were shut down during October 2016 to allow the new tracks to be connected, with the Level Crossing Removal Authority being there to photograph the removal of the now-redundant boom gates. 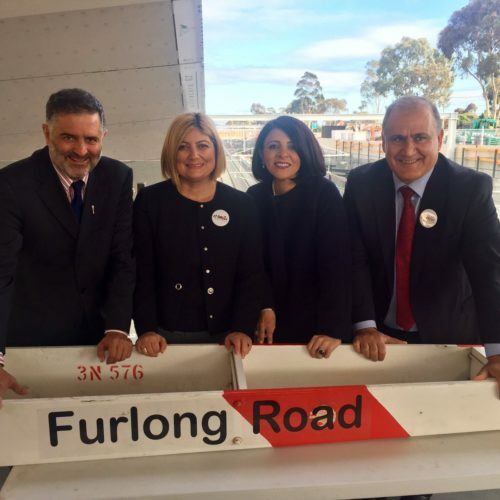 Local MP Natalie Suleyman also paid a visit to the new Ginifer station on November 2 to pose with the celebrity boom gate. But the five minutes of fame for the boom gate soon ended – a week later it was sitting forgotten on the concourse at Ginifer station. You might think the story ended there, but in March 2017 I found the ‘Furlong Road’ boom again – dumped in a locked compound. Located 30 kilometres away in Blackburn! But even that wasn’t the final chapter – in September 2018 we met again, at the Metro Trains signal depot at Sunshine. And there it will presumably remain, the only chance of a second life requiring the destruction of a fellow boom gate at the hands of an oblivious motorist. So the obvious question – why Blackburn? “Why did the boom gate end up on the opposite side of Melbourne in Blackburn” I hear you ask. But the answer was a simple one to find – we thank the “Furlong Main Blackburn Heatherdale” level crossing removal project. 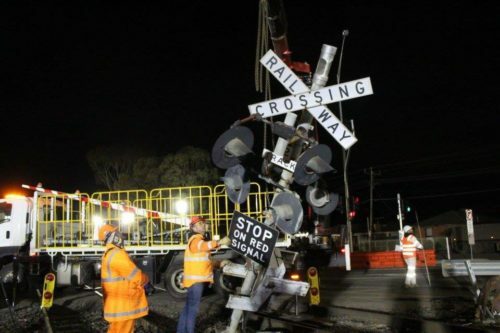 Over the next eight years, the Level Crossing Removal Authority will oversee the removal of 50 dangerous and congested level crossings across Melbourne, including level crossings at Furlong Road and Main Road in St Albans, Blackburn Road in Blackburn and Heatherdale Road in Mitcham. 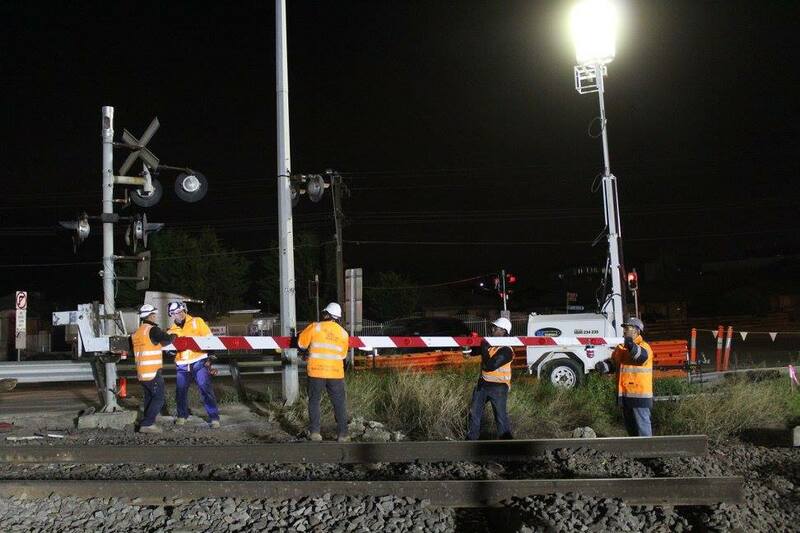 With four geographically dispersed level crossing removals delivered by one project team, presumably once the works at Furlong Road were completed the celebrity boom gate was relocated to their site compound at Blackburn, pending a return to the Metro Trains Melbourne spare parts pool with the completion of the project as a whole. “Boom barrier” is the official name for the devices used to indicate to motorists that a level crossing is closed, but for some reason the term “boom gate” has captured the public imagination, despite them having zero resemblance to an actual gate, so I’ve done the same here. So, boom gate, perhaps due to the history of gates blocking railways. That’s my theory as well – the original level crossing gates were actual gates. It’s fascinating how the Google Books Ngram Viewer for the word “boom” shows usage increasing to 1940 then trailing off with a short recovery. I wonder if that comparison includes ‘boom’ as in ‘explosion?